What should the response be to the chemical attack on Syrian civilians? April 06, 2017, 1:38 p.m.
On Tuesday reports emerged of chemical weapons being used on civilians in the Syrian town of Khan Sheikhun. Western governments believe the attack was launched by forces loyal to President Bashar al-Assad – despite the denials of the Syrian regime and its Russian allies. UK foreign secretary Boris Johnson stated that he’d “like to see those culpable pay a price”, although Theresa May seems to be shying away from such an option. Likewise, while US President Donald Trump branded the attacks an “affront to humanity”, he too has yet to indicate that any action will be taken as a result. New YouGov research in the UK and US reveals what the public in each country believe the reaction to the attack should be. As is often the case with complex geopolitical situations such as this, a high proportion of people (33% in the UK, 30% in the US) do not know what most appropriate response is. Large numbers in both Britain (45%) and the US (59%) want to see some kind of response, although in both countries they are fragmented about what it should be. The most popular approach is to boost support for Western-backed rebels, but to go no further (17% in the UK, 21% in the US). Such forces are much smaller and weaker in today than they were a few years ago, so it is not clear how much this approach would achieve. There is also splintered support for more of a direct military response. 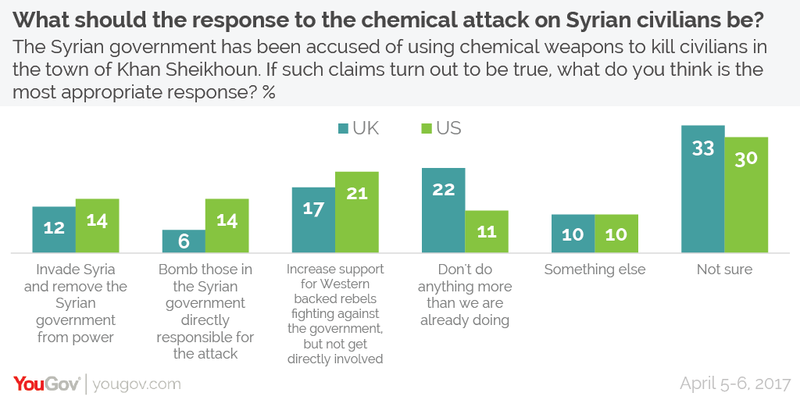 Targeted air strikes aimed at those within the regime responsible for the chemical attack are supported by 6% of Brits and 14% of Americans. There is also notable support in both countries for an invasion of Syria in order to overthrow the Assad regime, an approach which is backed by 12% of Britons and 14% of Americans. Britons are twice as likely as Americans to not want to respond to the attack at all. More than one in five (22%) of British people said that they didn’t think we should do anything more than we are already doing as a result of the attack, compared to just over one in ten (11%) of people in the US. In domestic political terms, there was not a huge variation in responses between voters of different parties in either country. The biggest exception to this was in the UK, where SNP and UKIP voters were much more likely to think we should not do anything more than we are already doing in response to the attacks (41% and 31% respectively against the national average of 22%).